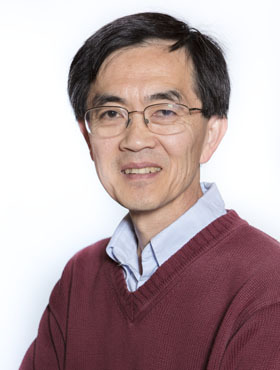 Principal Investigator: Se-Jin Lee, M.D., Ph.D. The overall focus of my research program has been to understand the molecular and cellular mechanisms underlying tissue growth and tissue regeneration with the long-term goal of developing new strategies for treating human diseases. The overall focus of my research program has been to understand the molecular and cellular mechanisms underlying tissue growth and tissue regeneration with the long-term goal of developing new strategies for treating human diseases. For virtually my entire career, I have been interested in understanding the roles of extracellular signals in regulating embryonic development and adult tissue homeostasis, and almost all of that effort has focused on the superfamily of secreted proteins related to transforming growth factor-ß (TGF-ß). At the time that I became interested in this group of proteins when I was a Staff Associate at the Carnegie Institution of Washington’s Department of Embryology, thirteen members of the TGF-ß family had been described in mammals. Many of these had been shown to play important regulatory roles during embryogenesis and in adult tissues, and many had shown promise for clinical applications, particularly with respect to tissue repair and tissue regeneration. Working on the assumption that many additional family members were yet to be identified and that these would also have biological activities that could be exploited for applications in regenerative medicine, I initiated a screen for new TGF-ß family members by taking advantage of the sequence homologies among the known family members. From this screen, which we continued after I moved my laboratory to the Johns Hopkins University School of Medicine, we identified a large number of novel TGF-ß family members that we have designated GDFs (growth/differentiation factors). Currently, the TGF-ß family in mammals encompasses over 35 distinct genes, and about one-third of these were discovered by my laboratory either solely or, in some cases, concurrently with other laboratories. Because many of these GDFs turned out to have highly tissue-specific and cell type-specific expression patterns, understanding their precise biological functions has become the focus of intensive study both by my laboratory and by many others. Without question, the most significant work of my laboratory has been the discovery of myostatin (GDF-8) and its role as a negative regulator of skeletal muscle mass . We showed that myostatin is expressed almost exclusively in skeletal muscle tissue both during embryogenesis and in adult animals and that mice in which we knocked out the myostatin gene have a dramatic and widespread increase in skeletal muscle mass. We showed that individual muscles of myostatin knockout mice weigh about twice as much as corresponding muscles from normal mice and that the increase in mass results from a combination of muscle fiber hyperplasia and hypertrophy. Based on these and subsequent studies, it is clear that myostatin performs two functions, one to regulate the number of muscle fibers that are formed during development and a second to regulate the growth of individual muscle fibers postnatally. Our discovery of myostatin and its in vivo function uncovered a completely novel mechanism by which skeletal muscle mass is regulated. Prior to this discovery, there had been no evidence for the existence of a negative regulator of muscle growth. Our findings have not only identified such a regulator but have also raised the possibility that myostatin may be responsible directly or indirectly for the regulation of muscle growth by a variety of other stimuli, including hormones and exercise. Moreover, our discovery of myostatin has revived some archaic theories about the regulation of tissue growth in general. Over 30 years ago, it was hypothesized that the size of a given tissue is controlled by the activity of a negative growth regulator (termed a chalone) that is produced specifically by that tissue and that acts to inhibit the growth of that tissue. Despite extensive efforts to obtain experimental support for this hypothesis, however, no molecules having the essential properties of a chalone have ever been isolated. Based largely on work from my laboratory, it is now clear that myostatin is, in fact, a muscle chalone. Our work has shown that negative growth regulation is an important mechanism for limiting skeletal muscle mass and has raised the possibility that negative regulators of this type may exist for other tissues as well. Hence, the mechanism of action of myostatin may prove to be a paradigm for how tissue growth and tissue size may be regulated throughout the body. In addition to the scientific significance of this work, our discovery of myostatin has launched a widespread effort in both the academic and pharmaceutical communities to exploit the biological properties of myostatin for both agricultural and human therapeutic applications. With respect to agricultural applications, our discovery suggested that blocking myostatin activity in livestock and aquatic species could be an effective strategy for dramatically improving meat/fish yields to help meet the shrinking world food supply. Indeed, we showed that the myostatin gene has been highly conserved through evolution, and, simultaneously with two other research groups, we demonstrated that mutations in the myostatin gene are the cause of the enhanced muscling seen in certain breeds of cattle that have been described as double-muscled by cattle breeders . With respect to human therapeutic applications, our discovery raised the possibility that inhibiting myostatin activity may represent a new strategy for increasing muscle growth and regeneration in the context of disease states characterized by muscle degeneration or wasting. This possibility was bolstered by a collaborative study that we carried out with Dr. Markus Schuelke and his colleagues in Germany in which we characterized a myostatin mutation in a child with about twice the normal muscle mass, thereby providing the first clear evidence that myostatin plays a similar role in humans as it does in mice and in cattle . Since our original discovery of myostatin, one major focus of our research effort has been to explore the potential beneficial effects of targeting this pathway in the context of diseases affecting skeletal muscle. For example, we have shown using a mouse model of Duchenne muscular dystrophy that loss of myostatin not only can cause increased muscle mass and strength in the setting of muscle degeneration but can also slow the development of fibrosis, suggesting that targeting myostatin activity may enhance muscle growth and muscle regeneration in patients with muscle degenerative diseases . We also showed that administration of high levels of myostatin protein to mice can induce a dramatic wasting process similar to the cachexia seen in patients with diseases such as cancer and AIDS . These findings raised the possibility that altered regulation of myostatin activity may play a role in the etiology of cachexia, which is a major cause of mortality in patients with cancer and yet is poorly understood at the mechanistic level. Whether or not altered signaling through this pathway underlies or contributes to the cachexia seen in these patients, our findings raise the possibility that targeting myostatin activity may be an effective strategy for counteracting the wasting process. Finally, we have shown that human therapeutic applications may not be limited just to muscle degenerative and wasting diseases. In particular, we showed that loss of myostatin can suppress fat accumulation and improve glucose metabolism in genetic and diet-induced models of obesity in mice . In this respect, I have speculated that the reason that the myostatin regulatory system has evolved to include such a complex regulatory network of regulatory proteins is that its primary physiological role is to regulate the overall balance between muscle and fat [7, 8]. Whatever the primary role of myostatin may be, our findings have raised the possibility that inhibition of myostatin activity may be a novel strategy for the prevention or treatment of metabolic diseases, such as obesity and type II diabetes. Indeed, one of most exciting prospects is that targeting this signaling pathway may provide a general strategy to combat both metabolic dysfunction and sarcopenia during aging. the identification of activin type II receptors as the receptors mediating myostatin signaling in vitro and in vivo [9, 10] . the development of engineered myostatin inhibitors capable of increasing muscle growth when administered systemically to adult mice [10, 11]. Some of this work would not have been possible without the valuable contributions of close collaborators, most notably Dr. Neil Wolfman’s group at Wyeth. Throughout the past two decades, I have worked extensively with both the academic and biotechnology/pharmaceutical research communities to explore potential clinical applications for our work. Indeed, I believe that our past work on myostatin has played a major role in stimulating the enormous effort directed at understanding the control of muscle growth by this signaling mechanism. A PubMed search with the term “myostatin” now lists over 2100 papers, and at least seven biotechnology and pharmaceutical companies have initiated clinical trials with agents targeting myostatin signaling to treat patients with debilitating muscle loss, including patients with muscular dystrophy, inclusion body myositis, muscle atrophy following hip fracture surgery, age-related sarcopenia, and cachexia in chronic obstructive pulmonary disease, end stage renal disease, and cancer. At least 12 of these clinical trials have reached phase II or III. Proc. Natl. Acad. Sci., USA 94:12457-12461, 1997. New Engl. J. Med. 350:2682-2688, 2004. J. Clin. Invest. 109:595-601, 2002. Immun., Endoc. & Metab. Agents in Med. Chem., 10:183-194, 2011. Proc. Natl. Acad. Sci., USA 98:9306-9311, 2001. Proc. Natl. Acad. Sci., USA 102:18117-18122, 2005. Proc. Natl. Acad. Sci., USA 100:15842-15846, 2003. Proc. Natl. Acad. Sci., USA 110:E3713-22, 2013. Proc. Natl. Acad. Sci., USA 109:E2353-E2360, 2012. Pioneering scientist Se-Jin Lee, a leader in the study of muscle development, moves his groundbreaking research program to JAX.